Just a few days ago the Samsung SM-E500F got leaked for the first time, and back then we speculated that it could be the first member of an upcoming Galaxy E series from the Korean smartphone maker. We arrived at that idea based on the E in its model number. Samsung hasn't so far released a phone with that letter in its model number, and the recently unveiled Galaxy A devices both have A in their model numbers. If all of this pans out, then there's another lineup of handsets coming from Samsung in the future too, and these ones could be called Galaxy J. 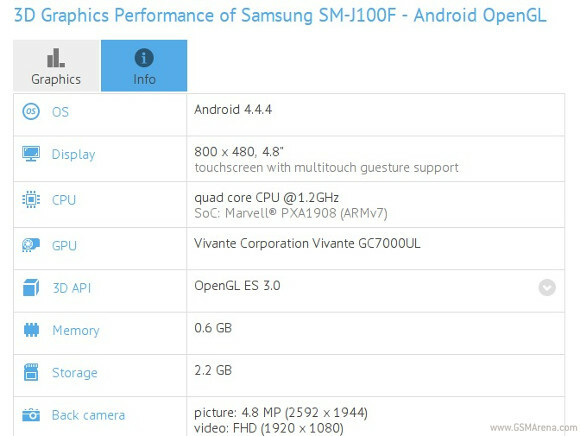 That's because a previously unheard of Samsung SM-J100F got put through the paces of a graphics benchmark for Android. As always, this has resulted in a list of its most important specs becoming public. The J100F boasts a 4.8-inch 480x800 touchscreen, a 5 MP rear camera with LED flash, a 5 MP front camera (both with 1080p video recording support), 1GB of RAM, and 4GB of built-in storage (of which 2.2GB will be user accessible). Running the show is a not often seen Marvell PXA1908 chipset, which has 64-bit support and a 1.2 GHz quad-core Cortex-A53 CPU. A Vivante GC7000UL GPU is also present. Although exact mobile data connectivity options haven't been revealed by the benchmark, the SoC in the J100F does support 4G LTE Cat.4 (with theoretical peak download speeds of up to 150Mbps), so hopefully that's made it into this smartphone. The benchmarked handset runs Android 4.4.4 KitKat, and it also has Bluetooth, Wi-Fi, and GPS. It's clearly a low-end offering through and through, we'll have to see how well it's going to be priced in order to know whether it will sell in any significant numbers. Chinese manufacturer low end starts with HD screen, snapdragon 400 at 100$ and Samsung wants to compete with 480p, some obscure chipset at similar price range or a 450$ metal frame phone of same specs.